Above: Porsche Cayenne Turbo Coupé (left) and Cayenne Coupé. Porsche's had a badly kept secret for some time now: It has been developing a coupe body style for the Cayenne SUV, so it came as no surprise when the automaker officially unveiled it today. 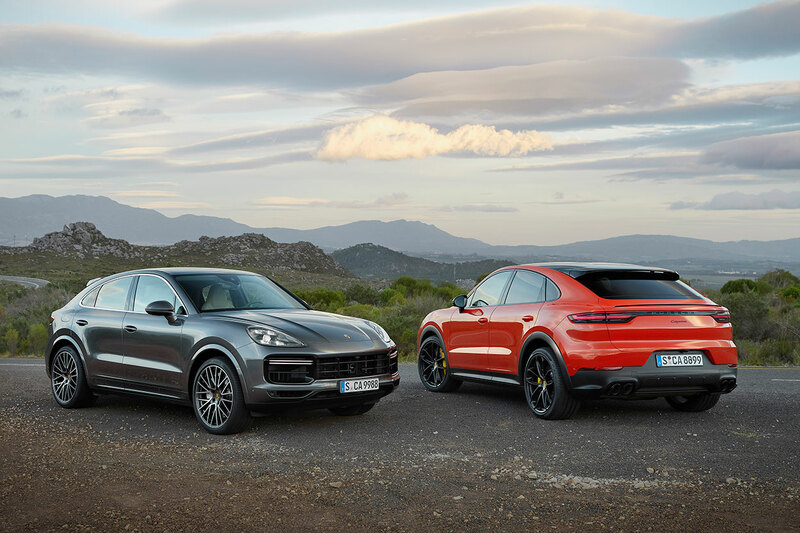 The new Cayenne Coupé and Cayenne Turbo Coupé will be arriving in dealership showrooms in fall 2019. Above: Profile of Cayenne Coupé. The new body style is exactly as it sounds, a slightly lower Cayenne with a more steeply raked roofline, particularly at the rear, where it slopes downward more aggressively and is adorned by an adaptive roof spoiler. Porsche also says the windshield and A-pillars are “shallower” due to a roof edge that’s been lowered by 0.78 inches, which also contributes to a sleeker profile. To tie the changes together, Porsche redesigned the rear doors and rear quarter panels and made the license plate bracket part of the rear bumper. The new, standard roof is a panoramic glass piece with an integrated sunshade, while buyers may also choose an optional carbon-fiber roof. Choosing the latter also nets you several other sporty features, including new, lightweight 22-inch GT Design wheels, pepita fabric seat centers, carbon-fiber and Alcantara interior accents, and, for the Turbo Coupé, a sport exhaust. Above, clockwise from top left: Cayenne Turbo Coupé with the standard glass panoramic roof. The optional carbon-fiber roof as seen on a Cayenne Coupé. Interior seating with pepita inserts in a Cayenne Coupé with the carbon-fober roof option. Though there’s no mention of S, GTS, or E-Hybrid versions yet, Porsche will launch the base and Turbo Coupés together. The Coupé gets the 3.0-liter 335-horsepower V6, allowing it a 0-60-miles-per-hour time of 5.7 seconds, or 5.6 seconds with the carbon roof. Top speed is 151 mph. The Turbo Coupé is equipped with the 4.0-liter twin-turbocharged V8 making 541 hp, and it’s much quicker: 0-60 mph in 3.7 seconds. Top speed is 178 mph. Above: Cayenne Turbo Coupé with its rear spoiler deployed. People who opt for a Cayenne Coupé over the standard body style also receive some other standard goodies that are otherwise options. They include Porsche’s adaptive suspension (PASM, or Porsche Active Suspension Management), Sport Chrono Package, and 20-inch wheels. New eight-way sport seats in front are also standard, though comfort seats are a no-cost option. The back seat bench is shaped to mimic individual seats, with room for two. The lower roofline shouldn’t affect rear-seat headroom too much, as the seats also have been lowered by 1.18 inches to accommodate the exterior styling without affecting comfort. Luggage space in the Coupé is 22 cubic-feet with the rear seats up, 53.3 cu-ft with them folded down. The Turbo Coupé’s storage area is a slightly smaller 21.2 cu-ft with the seats up and the same as the base model folded down. The Cayenne Coupé is offered at $75,300, while the Turbo Coupé starts at $130,100, not including the $1,250 destination fee. Look for the Cayenne Coupé in showrooms starting in fall 2019. New for the Cayenne Coupe models, eight-way Sport Seats are standard equipment in the front. The new seats, which are similar to the 18-way Adaptive Sport Seats that are standard equipment in the Turbo model, offer generous lateral support and feature an integrated headrest. In the rear, the Coupe comes fitted as standard with a rear bench that has the characteristics of individual seats. Alternatively, the comfort rear seats – a familiar feature of the Cayenne – are available as a no-cost option. Rear passengers sit 1.18 inches lower than in the Cayenne, meaning there is plenty of headroom despite the vehicle’s sporty lowered silhouette. Cargo volume is 22 cubic feet and increases rises to 54.3 cubic feet with the rear seats folded. The Cayenne Turbo Coupe has 21.2 with the rear seats standing and 53.3 cubic feet of cargo area volume with them folded.